So,…..I’m about a week behind with the whole blogging thing. We had a jammed packed weekend in Illinois last week (you have a bunch of Chicago area blogs to look forward to over the next few days) and we’re still getting back in to our routine here back in Michigan. Before we left last Thursday, I had to work my usual evening shift. My day actually started in the Zeeland area before ending up in the Muskegon area. I had time between my appointments and wanted to stop somewhere for lunch. That somewhere is a little drive-in I have passed many, many times on US 31 in Grand Haven, but have never had time to stop. Ray’s Drive-In in a small building on Beacon Street which most people will recognize as U.S. 31. If it wasn’t for the flashing LED sign out front, you’d probably never notice it. Just a square building with a parking lot and inconspicuous food items written in large letters across the facade. My stop needed to be pretty quick and I picked just the right place. The only thing inside the building is an order counter. There are no seats. There is no dining room. The menu is posted above the counter and there are a couple of cash registers to keep people moving on busy days. An older couple was ordering in front of me so I wasn’t paying attention until another cashier asked if I was ready. The menu is simple. Burgers, dogs, fries, shakes, etc. 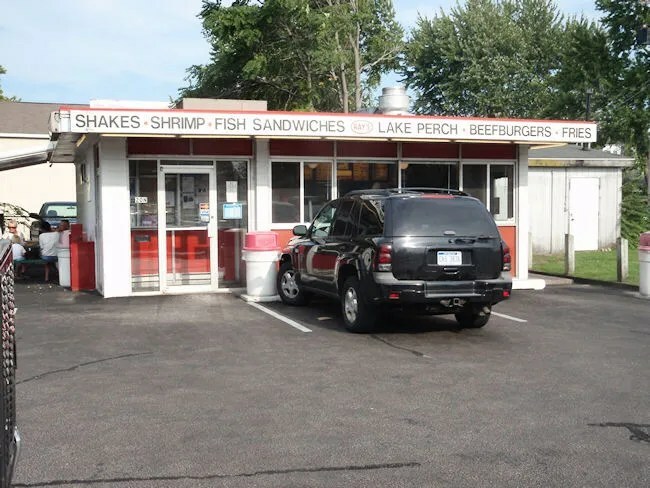 Typical diner/drive-in food. The amazing thing is the price. I ordered a Triple Cheese Burger and an order of fries. The price, just over $3.50. The order was written on a paper bag and handed back to the kitchen. Not long after I fished four bucks out of my wallet, the cook came up to the counter and handed me the bag. 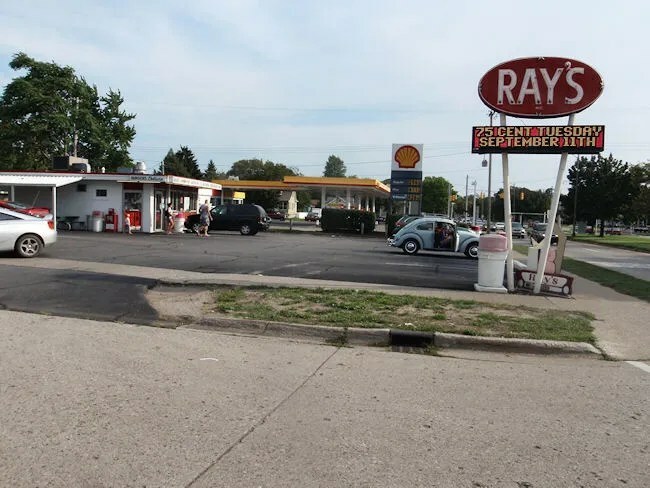 There are a couple of picnic tables outside of Ray’s, but most people tend to eat in their cars or take the order to go. I still had a little bit of time, so I chose to eat in my vehicle. 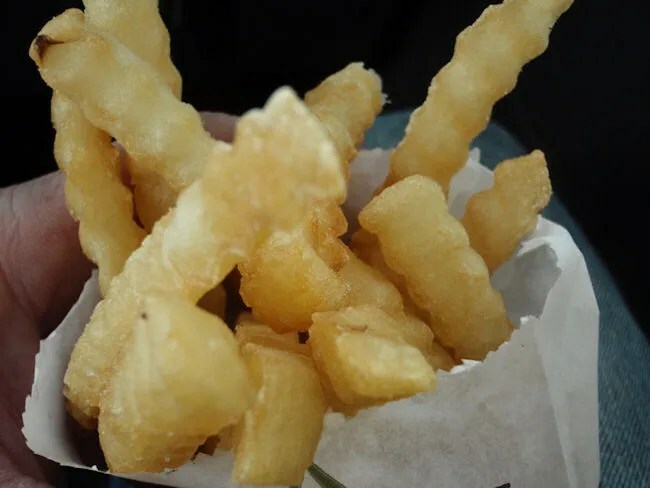 I started with the crinkle cut fries which were crispy and golden brown. They had a pretty heavy salt coating on them. Sort of what you’d expect from a fast food joint. When I ordered the Triple Cheese Burger, I didn’t actually know if I was getting three meat patties or three different types of cheese. There was no menu description and I’ve gotten surprised by that before. Didn’t matter to me either way. I’d eat whatever was in the wax paper wrapping. The Triple Cheese is actually three meat patties with cheese between each layer (yay!). 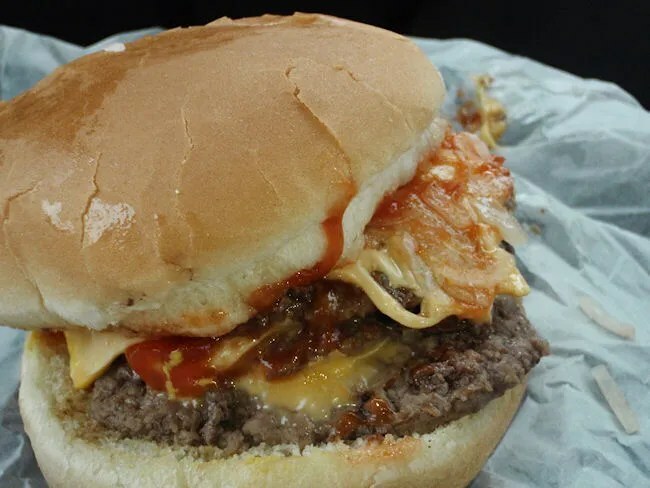 It’s served on a standard, flaky white bun with ketchup, mustard, pickles and onions. I wiped most of it off because I really wanted the onions gone. I like ketchup and mustard on cheap burgers, but I don’t love it, so I wasn’t sad to see it go. The burger was quite good and hit the spot as greasy drive-in food. 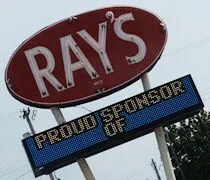 With Grand Haven being a tourist town, Ray’s is the kind of spot that you will always remember. It will be the place you long for when you have kids of your own and you bring them back to Grand Haven for family vacations. The food is just good enough to keep the doors open and the prices are amazingly cheap. The thing you walk away from Ray’s with is that nostalgia and the memory of getting a burger on the way to or from the beach on a warm summer evening. If you stop again, get a shake! I just went for the first time and the peanut butter shake made the meal (in addition to the price). I’ve been eye-ballin’ this place for years – thanks to your post, I’ll be stopping in the next time I’m over there!! They have the best burgers in Michigan.